Teachers with My BrainPOP educator accounts can create and assign their own quizzes. Click Quiz Mixer at the top of the screen. Give your quiz a Working title and subject, then click Create Quiz. Click the Write tab to write your own questions. Select your Question Type, Answer Type, and Question Image Format if there’s an image. Then click + Add to Quiz. 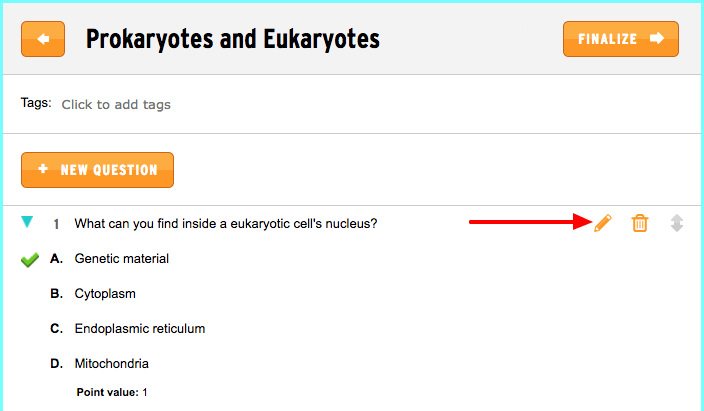 You can also click the Search tab to search other teacher-created quizzes. To add a single question, click the + next to the question. To add the entire quiz, click the + across from the title. To edit a quiz, click the pencil icon next to the quiz title. Then, click the pencil icon next to the question you want to edit. Click Save Changes to return to your quiz. When finished adding questions, click Finalize. You can share your quiz with the wider BrainPOP educator community if you’d like. 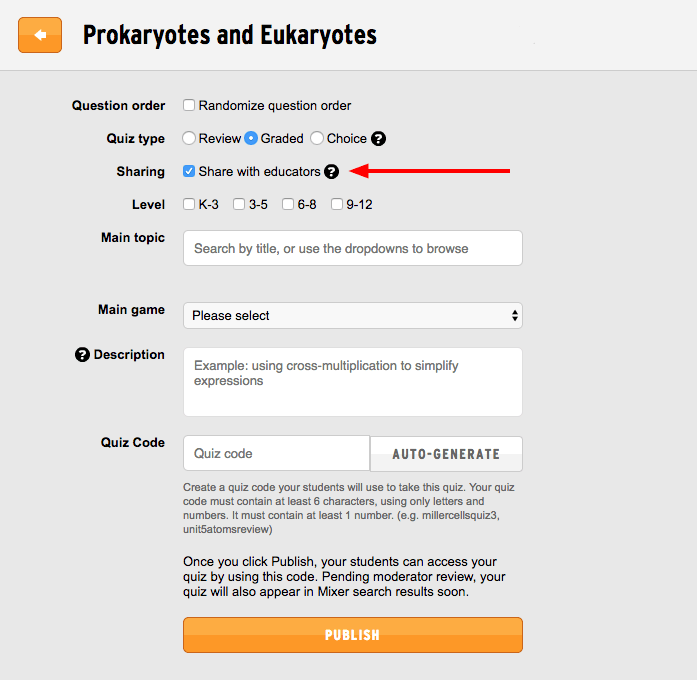 To share the quiz with your students, create a quiz code or have one auto-generated for you. 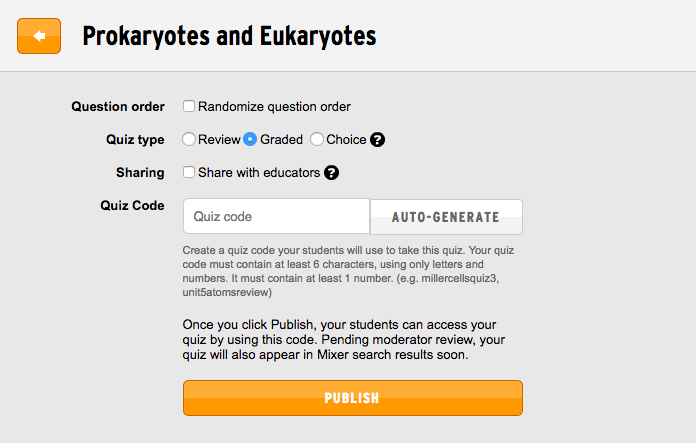 You can also choose to share your quiz with other educators. Click Publish, then Done or Assign to Class. Your new quiz appears in your list of quizzes. You’ll also notice the Edit, Duplicate, Print, and Delete icons. Note: Editing a quiz will un-publish it. Your students will not be able to take it until you re-publish it. We also have a printable Step Guide for using the Quiz Mixer. How can I search Mixed Quizzes? There are two search bars in the Quiz Mixer. The search bar located to the right of + New Quiz allows you to search through the quizzes that you have created. The search bar located at the top left of the screen will take you out of the Quiz Mixer and search content on BrainPOP. Once you select + New Quiz and give your quiz a title and subject, you can use the search bar to search quizzes and questions from other educators. Select Search All Text to search our shared quiz library’s titles, questions, and correct answers. Select Search By Topic to choose shared quizzes by BrainPOP topic. What do Draft, Private, Pending publication, and Shared mean? Draft – This is an unpublished quiz that you are still working on. Your students cannot take it until you finalize it. Private – This is a finalized quiz that you have not shared with other educators. Only your students are able to view and take the quiz. Pending approval – This is a finalized quiz that has not yet been reviewed for approval by our moderators. Your students can take the quiz, but it will not be visible to other educators until it is approved. Shared – This is a finalized quiz that you have shared with other educators. I forgot my quiz code! Where can I find it? In the Quiz Mixer, you can expand each quiz by clicking on the arrow located to the left of the title to view its code. Can students email their quiz results to me? Yes. When your students complete a quiz, they can print their results, review them, or email them to you. If you’ve set up classes through My BrainPOP, students can submit completed quizzes directly to your My BrainPOP educator account. You will be able to score open-ended questions, make comments, and track progress. Will the Quiz Mixer grade open-ended questions? No. You must grade those questions manually. However, if you’ve set up classes through My BrainPOP, you can grade open-ended questions and send scores back to students through the site. Where can I find the most recent teacher-generated quizzes about a particular topic? Search for the topic on BrainPOP or Brainpop Jr.
Click Lesson Ideas at the bottom of the screen. Recent quizzes appear on the right side of the screen. Click a quiz to see it in the Mixer! Why won’t my quiz print? Clicking Print brings up a popup printer dialog window. If the popup doesn’t appear, check your settings to see if pop-up blocking is enabled on your browser. You can temporarily turn off pop-up blocking in order to print on BrainPOP.